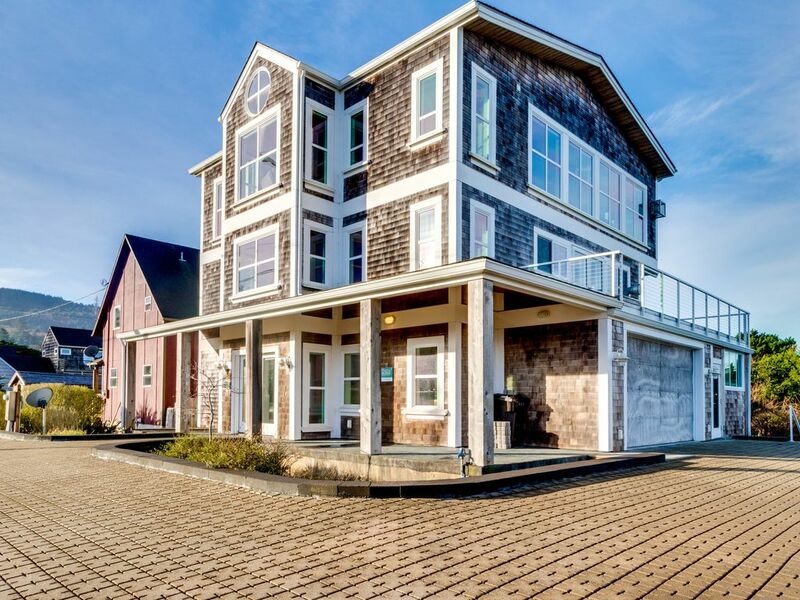 Discover a truly inclusive coastal getaway at this three-bedroom Cape Meares home, a luxurious, light-filled retreat with a private hot tub and steam sauna, a deck that overlooks the ocean, and an elegant interior perfectly outfitted for guests with limited mobility. This stately shingled home sits within sight of the ocean, one block south of Cape Meares Lake and an access point to the beach. Find blissful solitude on the sand at Bayocean Peninsula Park two miles north, pick up a few of your favorite beach snacks at the Tillamook Cheese Factory 10 miles east, and soak in the gorgeous views from Cape Meares Lighthouse and State Scenic Viewpoint three miles south (please note that a road closure has made this a 15-mile drive via Oceanside). An ideal space for a multi-generational family, this air-conditioned home offers comfort and ease to each and every guest. Enjoy use of a wheelchair-accessible shower and steam sauna, doorways that can accommodate a 35-inch wheelchair, and an elevator that serves all three levels of the house (please note that the elevator is available only to guests with limited mobility upon advance request). Wake up each morning to read the paper or watch TV on the spacious sectional sofas, help prepare breakfast beneath vaulted ceilings in the kitchen (with stainless steel appliances and a dishwasher), and step out onto the deck to breathe in the fresh ocean air. Spend your afternoons searching for sand dollars, and return home to unwind in the private hot tub and sauna, curl up in front of the gas fireplace, and share photos of the day's adventures on the free WiFi. Plan a vacation everyone can enjoy on the Northern Oregon Coast - book your escape to Cape Meares today! Parking Notes: There is plenty of room to park in the large driveway, including right out front. Open and bright house - perfect for whether it is good weather or bad. Only suggestion would be to coordinate the instructions for when leaving. The displayed instructions in the house mention turning the heat up to 80 degrees while the online email/instructions reference turning it off. A longer aux cord to plug in different music devices to the stereo would be nice as well. Jason, thank you for the valuable feedback on making the home visitor friendly! Thank you! The house was great! The kitchen is amazing. its perfect for the amount of people that its advertised for. very clean. the only reason i didn't give it a 5 star review was because the mini fridge wasnt working. so we had to make space if the fridge for both food and drinks. i would also add that after pressing all the buttons there was no instruction on how to use the steam room. we figured it out but some instruction would help. other than that. again this is the second time we've stayed here and i would recommend and come back every year. Great place on the ocean! Love the big room at the top. Great views! Great open feel! Amazing house! Excellent amenities and great location. We'll be back. Loved the third floor. Open, beautiful view, and loved the big dinning room table. Loved the openness of the third floor and the big table that allowed us all to play games. Small bedrooms and some of the mattress need to be replaced. We appreciate your feedback and will keep a lookout for any more comments regarding the mattresses as we understand that each person has a different preference.